Left of Center Creative Challenges: Challenge #21 Christmas! If you are looking for the DT Call - please check here! Welcome to the last Challenge of 2013! Can you believe it's almost Christmas? Not long to go now and my kids are super hyper waiting for the big beardy man! 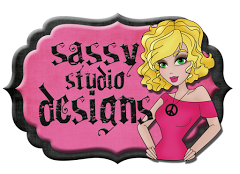 This fortnight we are delighted to be sponsored by Sassy Studio Designs and the theme, quite predictably, is 'Christmas'! Hello I am a Mum to one Son who is now nearly 19, and wife to wonderfully supportive Husband who has supported me and my obsession with my craft work for 20 years now. I also work full time as an Optical Dispenser in a small private Optometry Practice in the small country town in North East Victoria Australia. I am also a DT member on 2 other Challenge blogs and love every minute of it. My craft room is my haven it is where I go at the end of the day to unwind. I call it my mental health plan. I think all I want to achieve with my craft is to make people smile if I achieve that then it is a good day. And now for some inspiration from the rest of the team! 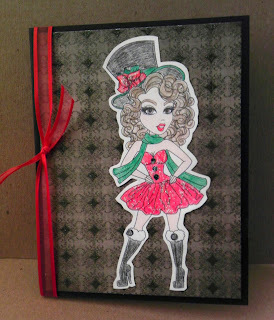 Keren - Handmade Gifts - check out her blog for more info! I hope you will agree, we have some fabulous inspiration here - both Christmassy and a bit LOC! So why not join the challenge and have a go for a chance to win a prize from our sponsor. Also, please remember that the DT Call is still open and we'd love you to apply! Check out the post here. Thanks from Mo and the LOC Crew!